Nathaniel Vincent (c.1639-1697) was English a nonconformist minister, ejected in 1662 and several times imprisoned. He was probably born in Cornwall about 1639, son of John Vincent (1591–1646), who was nominated by the committee of the Westminster Assembly to the rectory of Sedgefield, Durham. Nathaniel, the third son, entered Oxford University as a chorister on 18 October 1648, aged 10. He matriculated from Corpus Christi College on 28 March 1655, graduated B.A. from Christ Church, Oxford on 13 March 1656, M.A. on 11 June 1657, and was chosen chaplain of Corpus Christi College. He was appointed by Oliver Cromwell one of the first fellows of his Durham University, but never resided there. At twenty he was preaching at Pulborough, Sussex, and at twenty-one was ordained and presented to the rectory of Langley Marish, Buckinghamshire. He was ejected in 1662, after which he lived three years as chaplain to Sir Henry and Lady Blount at Tyttenhanger House, Hertfordshire. About 1666 Vincent went to London. There his preaching at once attracted attention, and a meeting-house was built for him in Farthing Alley, Southwark, where he gathered a congregation. In spite of fines and rough handling by soldiers sent to drag him from his pulpit, he continued preaching. In July 1670, soon after his marriage, he was confined in the Marshalsea prison. He was removed to the Gatehouse, Westminster, on 22 August. He remained six months in prison. In 1682 he was again arrested, brought before magistrates at Dorking, and sentenced to three years’ imprisonment, after which he was to be banished the country. A flaw in the indictment meant after the section expenditure of £200. Vincent was released, but weakened by illness. He was again arrested in February 1686, this time on a charge of being concerned in Monmouth’s rebellion. Some of his books were written in prison. 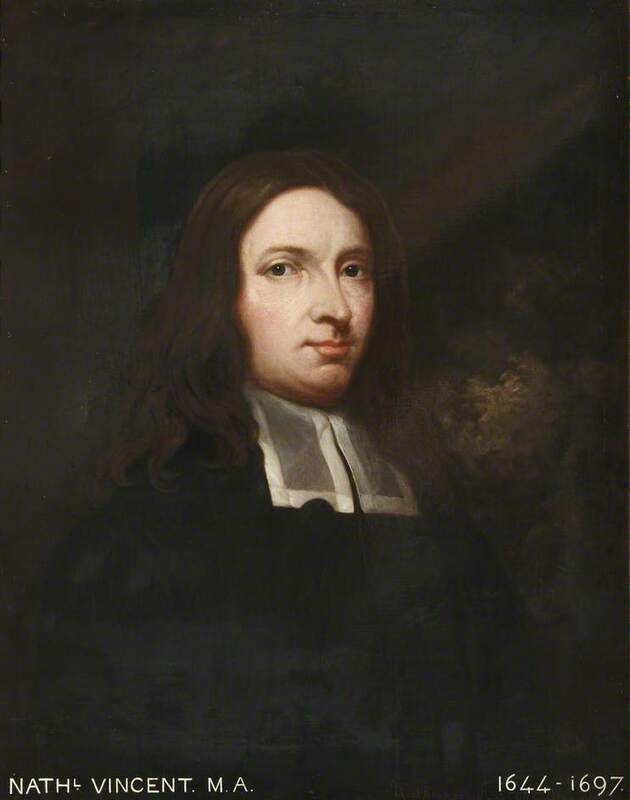 Poole, Matthew. The Pope and His Councils Are Not Infallible. (Matthew 23:8-10) – pdf, 24 pp. Baxter, Richard. Christ, and Not The Pope, is The Universal Head of The Church. (1 Corinthians 12:27-28) – pdf, 19 pp. Hurst, Henry. Kings and Emperours Are Not Rightful Subjects to The Pope. (Acts 26:2) – pdf, 36 pp. Wilkinson, Henry. The Pope of Rome is Antichrist. (2 Thessalonians 2:3-10) – pdf, 25 pp. Fowler, Christopher. The Scripture is to Be Read By The Common People. (1 Thessalonians 5:27) – pdf, 44 pp. Manton, Thomas. The Scripture is a Sufficient Without Unwritten Traditions. (2 Thessalonians 2:15) – pdf, 15 pp. Doolittle, Thomas. Popery is a Novelty. (Jeremiah 6:16) – pdf, 96 pp. Jenkyn, William. No Sin is Venial. (Romans 6:23) – pdf, 38 pp. Vincent, Nathaniel. Public Prayer Should Be In A Known Tongue. (1 Corinthians 14:15) – pdf, 17 pp. Owen, John. The Testimony of the Church is Not The Only, Nor The Chief Reason of Our Believing the Scripture to Be The Word of God. (Luke 16:29) – pdf, 44 pp. Veal, Edward. Are The Good Works of Believers Meritorious of Eternal Salvation? (Psalm 62:12) – pdf, 40 pp. Clarkson, David. The Doctrine of Justification Is Dangerously Corrupted in The Roman Church. (Romans 3:24) – pdf, 17 pp. Needler, Benjamin. God is Not To Be Worshipped As Represented By An Image. (Matthew 4:10) – pdf, 34 pp. Vink, Peter. Protestants Separated For Christ’s Name’s Sake. (Luke 6:22) – pdf, 27 pp. Mayo, Richard. Invocation of Saints and Angels Unlawful. (Romans 10:14) – pdf, 29 pp. Lye, Thomas. No Works of Supererogation. (Luke 17:10) – pdf, 30 pp. Vincent, Thomas. The Popish Doctrine Which Forbiddeth to Marry Is A Devilish And Wicked Doctrine. (1 Timothy 4:1-3) – pdf, 39 pp. Author Unknown. The Nature, Possibility, and Duty of a True Believer Attaining to a Certain Knowledge of His Effectual Vocation, Eternal Election, and Final Perseverance to Glory. (2 Peter 1:10) – pdf, 52 pp. Annesley, Samuel. Of Indulgences. (Hebrews 10:14) – pdf, 24 pp. Sylvester, Matthew. There Are But Two Sacraments Under The New Testament. (Proverbs 30:6) – pdf, 28 pp. Author Unknown. There is No Transubstantiation In The Lord’s Supper. (1 Corinthians 11:23-25) – pdf, 31 pp. Steele, Richard. The Right of Every Believer to The Blessed Cup In The Lord’s Supper. (Matthew 26:27-28) – pdf, 44 pp. Wadsworth, Thomas. Christ Crucified, The Only Proper Gospel Sacrifice. (Hebrews 10:12) – pdf, 29 pp. West, Edward. Purgatory A Groundless And Dangerous Doctrine. (1 Corinthians 3:15) – pdf, 26 pp. Lee, Samuel. The Visibility of The True Church. (Matthew 16:18) – pdf, 45 pp. A sermon on Psalm 8:5 preached before Charles II, October 4, 1674.